Mike Steglich and Thomas Schleiff announced CMPL. CMPL is a mathematical programming language and a system for modelling, solving and analyzing linear programming (LP) problems and mixed integer programming (MIP) problems. The CMPL syntax is similar in formulation to the original mathematical model but also includes syntactic elements from modern programming languages. 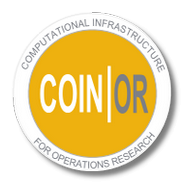 CMPL uses the COIN-OR OSSolverService to solve LP and MIP problems. For more information, please visit the CMPL project page.